The ideal waterfront location in York County! 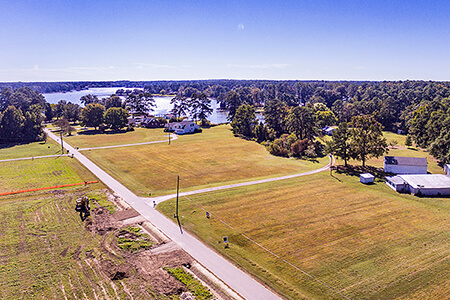 Holly Point is located in the heart of the Grafton area of York County and offers access to Patricks Creek which flows directly into the Poquoson River and the rest of the Chesapeake Bay. Preserved history can be found across the county; however, today York County is a thriving community where its residents can enjoy the waterside and easy an easy commute to the remaining cities that make up the Tidewater area of Virginia. The county stretches from south of Gloucester and bordering Williamsburg to the southern end of the Peninsula in Hampton. Holly Point residents can enjoy the best of the Hampton Roads area. York County is home to great schools, museums, local dining featured oysters from the Chesapeake Bay, and neighboring cities with even more attractions, shopping, and more! Experience lifestyle and the best days for you and your family with Custom Homes of Virginia in Holly Point. Custom Homes of Virginia believes that everyone deserves to live in a well-crafted home with high quality featured and finishes. Whether you are looking to relocate, downsize, or upgrade; let's make your home-ownership dreams a reality! 3 bed. 2 bath. 2,000 sqft. 3 bed. 2 bath. 2,150 sqft. 5 bed. 3 bath. 3,410 sqft. 4 bed. 3 bath. 2,770 sqft.